We also swung by Scotty’s Castle, but arrived too late to do both a tour and still make it to the crater. Instead, we wandered around outside the castle and toured the little exhibit hall. smatterings of wildflowers, and desert rocks. This entry was posted in Trips and Travels. Bookmark the permalink. That rocks. Makes you want to ride the bike around the inside rim really fast. I’ve climbed that son ofa and although getting to the center of it is really nice, you get warm while you’re there (geologically active) and THEN comes the uphill part… memory provides the image of my little brother, only about five at the time (yes, Doug was once small) with a sweaty t-shirt over his head to cool off, crying as he climbed that nasty trail. So, motorcycle interests aside, that posted picture is NOT pretty. Hee! Sorry for dredging up a repressed memory. 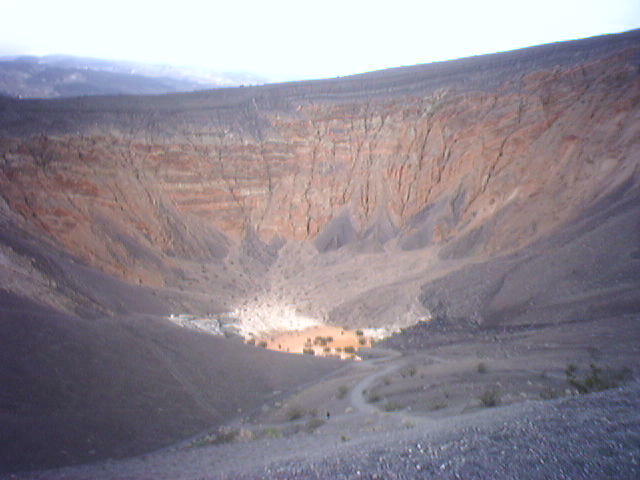 😉 We actually briefly considered climbing into the crater, but decided that we in no way wanted to walk back out of it. 😉 It was pretty cold when we were there, though.